Wheelersburg wide recevier Tanner Holden leads the Pirates onto the field to begin the 2018 season. Pirates running back Evan Horsley running the ball against the Ironton Tigers in their opening game of the 2018 season. 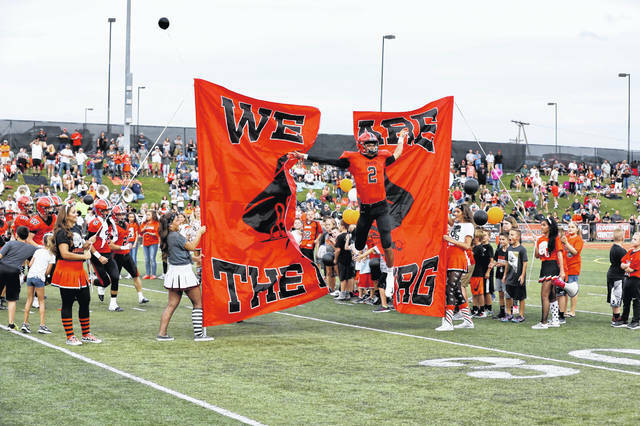 The defending Division V state champion Wheelersburg Pirates won their season opener against the Ironton Tigers, 28-6. From the outset, the game was all Pirates. After receiving the ball on a fair catch in the end zone, Ironton quarterback Gage Salyers took a 10 yard sack before throwing a 10 yard pick six to Trey Carter to give Wheelersburg the early 7-0 lead within the first minute of the game. On Wheelersburg’s first offensive possession, senior quarterback and first team all-state quarterback from a year ago, Trent Salyers, delivered a 52 yard bomb to Trey Carter for another Pirates touchdown. This would be Carter’s second touchdown of the game only halfway through the first quarter. 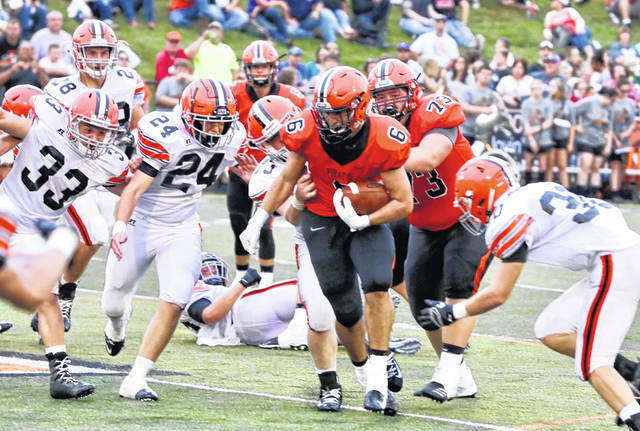 After this scoring outburst, the Ironton defense was able to mildly subdue the high powered Wheelersburg offense that averaged nearly forty points per game from a year ago. It would not be until the first two minutes of the second quarter that Ironton would allow Wheelersburg to score their next touchdown on a Trent Salyers 10 yard touchdown pass to Evan Horsley on a fourth down conversion attempt that put the Pirates ahead 21-0 nearly halfway through the first half. In a miraculous play, Ironton was able to score their only touchdown of the game on a thirty seven yard hail mary pass as time expired in the first half as Gage Salyers found a slippery Brycen Thomas on a jump ball. After the missed extra point, Ironton ended the half trailing 21-6. The lone score of the second half came in the final seconds of the third quarter as Trent Salyers found Dustin Darnell in the corner of the end zone on a 3 yard touchdown pass. This touchdown was Salyers third of the game and sealed the deal as Wheelersburg was victorious by a final score of 28-6.